Disney fan Tina Elliot dressed in a Big Thunder Mountain Railroad costume at the D23 Expo on Friday, July 14, 2017. 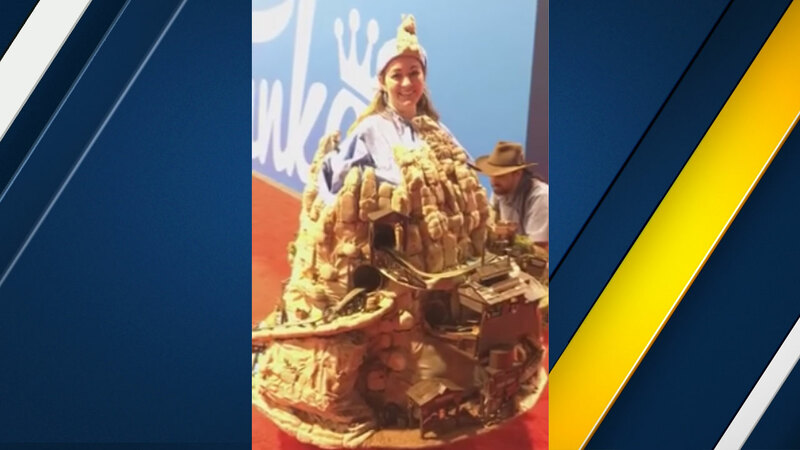 ANAHEIM, Calif. (KABC) -- A creative costume based on a classic Disneyland Park rollercoaster was a standout at the Disney D23 Expo in Anaheim on Friday. Disney fan Tina Elliot wore a Big Thunder Mountain Railroad dress that covered her from head to toe. Not only was the life-like gown three-dimensional, the costume also had a mini train traveling on a tiny railroad track around her body. When asked by ABC7's George Pennacchio why she came up with the idea, Elliot said, "Just the magic of Disney." Big Thunder Mountain Railroad is a mine train rollercoaster located in Frontierland at Disneyland Park in Anaheim and other Disney parks around the world. The ride debuted in September 1979. A creative costume based on a classic Disneyland Park rollercoaster was a standout at the Disney D23 Expo in Anaheim on Friday.